Intact Genomics chemically competent DL39 (DE3) E. coli cells are specific for transformation and protein expression in order to uniformly and specifically label :e.g. phenylalanine or leucine residues. DL39 (DE3) can also be used to reduce NMR cross-labeling via transaminase activity for valine, leucine, isoleucine, aspartate, phenylalanine, tyrosine and tryptophan residues. Deficient in the aromatic (TyrB), branched-chain (JIvE), and aspartate (AspC) transaminases. Transformation efficiency is tested by using the pUC19 control DNA supplied with the kit and using the high efficiency transformation protocol listed below. Transformation efficiency should be ≥1×108 CFU/µg pUC19 DNA. Untransformed cells are tested for appropriate antibiotic sensitivity. Follow these guidelines when using DL39 (DE3)chemically competent cells. 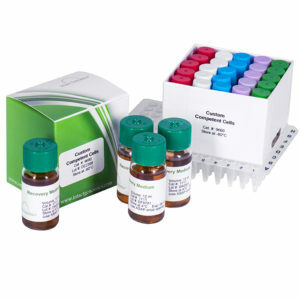 Use this procedure to transform DL39 (DE3) chemically competent cells. 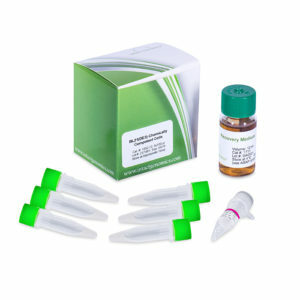 We recommend verifying the transformation efficiency of the cells using the pUC19 control DNA supplied with the kit. Do not use these cells for electroporation. 1) Remove competent cells from the -80 °C freezer and thaw completely on wet ice (10-15 minutes). 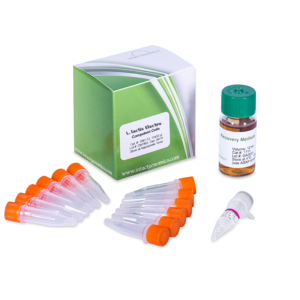 2) Aliquot 1-5 µl (1 pg-100 ng) of DNA to the chilled microcentrifuge tubes on ice. DNA to a chilled microcentrifuge tube, prior to adding 50 µl of cells. Mix well by tapping. Do not pipette up and down or vortex to mix, this can harm cells and decrease transformation efficiency. 4) Incubate the cells with DNA on ice for 30 minutes. 5) After 30 minute ice incubation, heat shock the cells at 42 °C for 45 seconds. 6) Transfer the tubes to ice for 2 minutes. 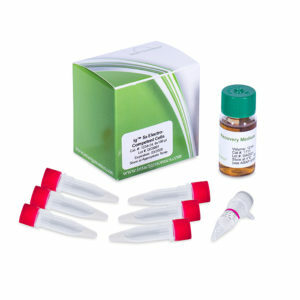 7) Add 950 µl of Recovery Medium or any other medium of choice to each tube. 8) Incubate tubes at 37 °C for 1 hour at 210 rpm. Pre-warmed selection plates. We recommend plating two different volumes to ensure that at least one plate will have well-spaced colonies. For the pUC19 control, plate 50 μl on an LB plate containing 100 μg/ml ampicillin. Use sterilized spreader or autoclaved ColiRoller™ plating beads to spread evenly. 10) Incubate the plates overnight at 37 °C. The following procedure results in only ~10% of the transformation efficiency as the protocol listed above. 1) Remove competent cells from the -80 °C freezer and thaw in your hand. 2) Aliquot 1-5 µl (1 pg-100 ng) of DNA to the microcentrifuge tubes. Do not pipette up and down or vortex to mix, this can harm cells and decrease transformation efficiency. 3) Incubate the cells with DNA on ice for 2 minutes. 4) After 2 minute ice incubation, heat shock the cells at 42 °C for 45 seconds. 5) Transfer the tubes to ice for 2 minutes. 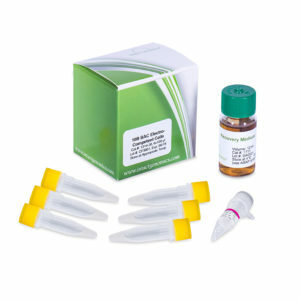 6) Add 950 µl of Recovery Medium at room temperature or any other medium of choice to each tube. Immediately spread 50 μl to 200 μl from each transformation on pre-warmed selection plates. We recommend plating two different volumes to ensure that at least one plate will have well-spaced colonies. For the pUC19 control, plate 50 μl on an LB plate containing 100 μg/ml ampicillin. Use sterilized spreader or autoclaved ColiRoller™ plating beads to spread evenly. 7) Incubate the plates overnight at 37 °C.